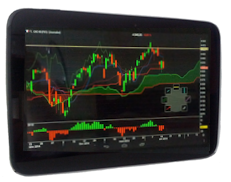 Axial Stock Trader is the latest application of the Axial Finance software range with a touch user interface totally adapted to smartphones and tablets. It allows to perform graphical and technical analysis of US and European stock markets with daily and Real-Time quotes, to follow Gainers/Losers for the current trading day and to create personal lists of stocks. Axial Stock Trader is free (OS Android) with daily quotes. First solution to combine technical and fundamental analysis in a graphic display with "RatioGraphes"
A particular ergonomic study to facilitate the utilisation for our clients.